When you are away from home, it is easy to feel especially helpless when confonted with news like yesterday's devastating earthquake in Christchurch. As with most major events in the last couple of years, we heard about this one through social media - the NZ guitar forum, actually. 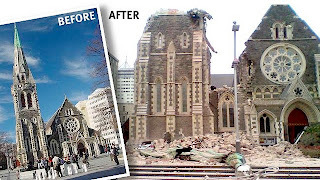 Mr Martin checked the forum over his breakfast and read that the spire had toppled from the Christchurch Cathedral. Thanks also to all the family who contacted us to let us know what was happening. 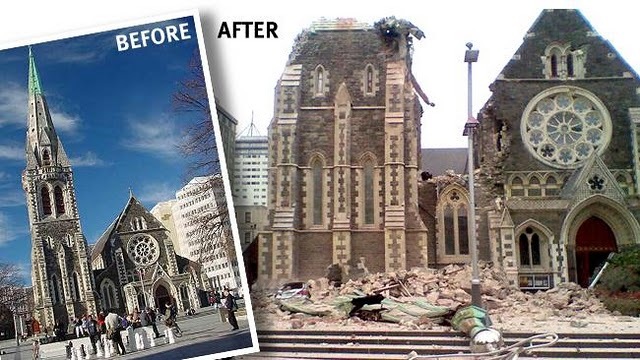 Fortunately, we don't have any family in Christchurch, and so far as we know, none of our friends have been badly affected - apart from property damage here and there. The telephone services throughout NZ are under stress. If you want to contact your friends and relatives in NZ, please use txts rather than making calls, if possible, or use internet resources like email/facebook etc for the next few days to free up the network for emergency services. The Salvation Army is a Christian organisation in NZ that is very well connected and will be providing a lot of support to Christchurch - especially to those who will be finding themselves homeless or without food or access to money. They are having an online appeal here and you can donate with a credit card from anywhere in the world. If you would rather donate to a secular organisation, the Red Cross in NZ also have an online appeal setup already. You can donate by credit card here. Their site is getting overloaded at the moment, but keep trying. Our thoughts are with everybody who is affected by this tragedy.